Досліджено диференціальну еволюцію орбіт астероїда (186256) 2003 ЕН1, що наближається до Землі, та комети 96Р/Мачхольца 1 на інтервалі часу 28000 років під дією планетних збурень. Використовувався Dsh- критерій Саутворта і Хокінса близькості орбіт. Показано, що комета і астероїд можуть бути фрагментами ядра однієї великої комети-родоначальниці комплексу Квадрантид. Руйнування комети- родоначальниці, можливо, відбулося 9500 років тому. Навколоземний об’єкт 2003 ЕН1 насправді є згаслим осколком ядра материнської комети. 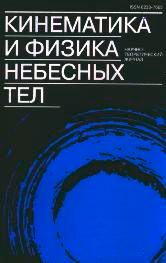 Зроблено висновок, що комета 96/Р Мачхольца 1, навколоземний астероїд 2003 ЕН1 групи Амура і метеороїдний рій Квадрантид складають сім’ю споріднених об’єктів. 1. Asher D. J., Clube S. V. M., Steel D. I. Asteroids in Taurid complex // Mon. Notic. Roy. Astron. Soc.—1993.—264.—P. 93—105. 2. Babadzhanov P. B., Kokhirova G. I., Khamroev U. Kh. The Sigma-Capricornids complex of near-Earth objects // Adv. Space Res.—2015.—55.—P. 1784—1791. 3. Babadzhanov P. B., Kokhirova G. I., Obrubov Yu. V. Extinct comets and asteroid-meteoroid complexes // Solar Syst. Res.—2015.—49, N 3.—P. 165—172. 4. Babadzhanov P. B., Williams I. P., Kokhirova G. I. Near-Earth obj ects in the Taurid complex // Mon. Notic. Roy. Astron. Soc.—2008.—386, N 3.—P. 1436—1442. 5. Babadzhanov P. B., Williams I. P., Kokhirova G. I. Meteor showers associated with 2003 EH1 // Mon. Notic. Roy. Astron. Soc.—2008.—386.—P. 2271—2277. 6. Babadzhanov P. B., Williams I. P., Kokhirova G. I. Near-Earth asteroids among the Iota Aquariids meteoroid stream // Astron. and Astrophys.—2009.—507, N 2.— P. 1067—1072. 7. Babadzhanov P. B., Williams I. P., Kokhirova G. I. Near-earth asteroids among the Scorpiids meteoroid complex // Astron. and Astrophys. —2013.—556, N 1.—P. A25 (5 p.). 8. Everhart E. Implicit single-sequence methods for integrating orbits // Celes. Mech.—1974.—10, N 1.—P. 35—55. 9. Green D. W. E., Rickman H., Porler A. C., Meeech K. J. The strange periodic comet Machholz // Science.—1990.—247, N 4946.—P. 1063—1067. 10. Jenniskens P. 2003 EH1 is the Quadrantid shower parent comet // Astron. J.— 2004.— 127.—P. 3018—3022. 11. Jenniskens P., Marsden B. G. 2003 EH1 and the Quadrantids // IAU Circ.—2003.—8252, N 2. 12. Kanuchova Z., Neslusan L. The parent bodies of the Quadrantid meteoroid stream // Astron. and Astrophys.—2007.—470.—P. 1123—1136. 13. Kresak L. On the similarity of orbits of associated comets, asteroids and meteoroids // Bull. Astron. Inst. Czech-Sl.—1982.—33.—P. 104—110. 14. Rudawska R., Vaubaillon J., Jenniskens P. Asteroid 2010 TU149 in the Taurid complex // European Planetary Science Congress 2012, held 23-28 September, 2012 in Madrid, Spain.—id. EPSC2012-886. 15. Sekanina Z. Periodic comet Machholz and its idio syncrasesies // Astron. J.—1990.—99, N 4.—P. 1268—1278. 16. Southworth R. B., Hawkins G. S. Statistics of meteor streams // Smith. Contrib. Astrophys.—1963.—7.—P. 261—285. 17. Whipple F. L. 1983 TB and the Geminid meteors // IAU Circular.—1983.—3881. 18. Wiegert P., Brown P. The Quadrantid meteoroid complex // Icarus.—2005.—179.—P. 139—157. 19. Williams I. P., Ryabova G. O., Baturin A. D., Chernetsov A. M. The parent of the Quadrantid meteoroid stream and asteroid 2003 EH1 // Mon. Notic. Roy. Astron. Soc.—2004.—355.—P. 1171—1181.